Look closer… Vertigo’s sick little brother sees snoop reporter Jimmy Stewart stuck in a wheelchair with nothing to do but waggle his long lens at the neighbours. Has he discovered a murder? Should he get involved? Should we? Too late, already. With the camera locked inside Stewart’s room for the entire film, Hitchcock’s chilling essay on voyeurism (read: movie-going) stares right back at you. Meaning? 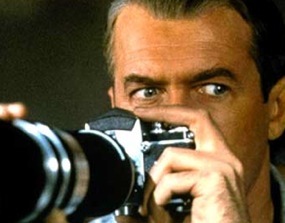 Rear Window is the definitive guilty-pleasure movie. Watch it in a double-bill with Michael Powell’s Peeping Tom, then go for counseling. Ignore the coma-inducing restoration chatter on the DVD’s excellent 55-minute doc. There’s a plethora of critics (including director Curtis Hanson, Peter Bogdanovich and Robin Wood) and crew to dig into the film’s thematic payload and production backstories. There’s also a 13-minute interview with screenwriter John Michael Hayes, a hefty stills gallery, promo stuffing and trailers.